Bedford’s attention to detail, combined with a serious commitment to excellence, has helped us become one of the nation’s most trusted commercial real estate consultants. Of paramount importance is our clients’ trust. As a result, we are unyielding when it comes to providing concise, technically sound studies and solutions that exceed client expectations. From The Conversation to The Bedford Warranty; the first phone call to receipt of our No-Cost Audit Support Certificate; our team is committed to your complete satisfaction – every step of the way. Don’t just take our word for it. Get us involved with your next project and experience Bedford yourself. This may sound like a simple term but understanding your needs and strategies up-front is of paramount importance to us. Based on an agreed-to scope of services, our engineers and professionals go to work to provide you with the most comprehensive, defensible work product. your specific tax strategies, based on your circumstances. 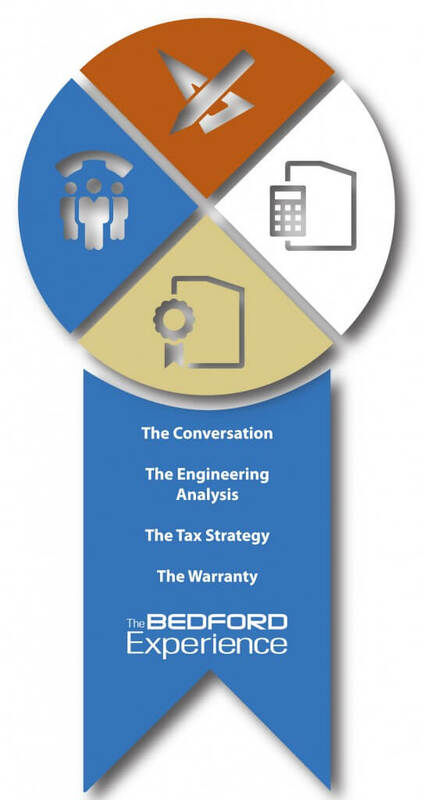 The Bedford Warranty provides “no-cost” audit defense in the unlikely event of an audit.